It's the season of romance, and Kate has invited eminent love guru Dr. Karen Love to the island to help your guests find true love and be their most romantic selves. 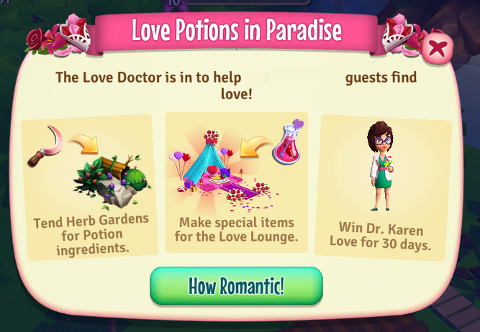 All they need is the right setting and Dr. Love's patented, 100% guaranteed (no money back) love potions! 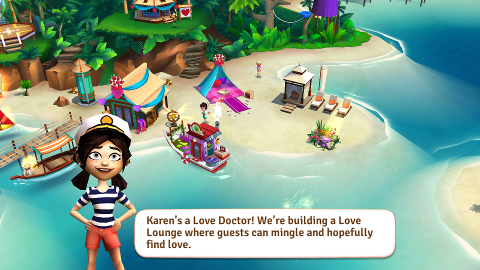 If you are at least Level 10, you will get the chance to interact with Dr. Karen Love as she tries to help your guests find true love this season! 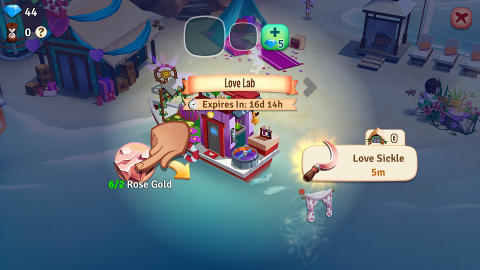 Start off the event by tapping on the Love Lounge located beside your Boathouse. 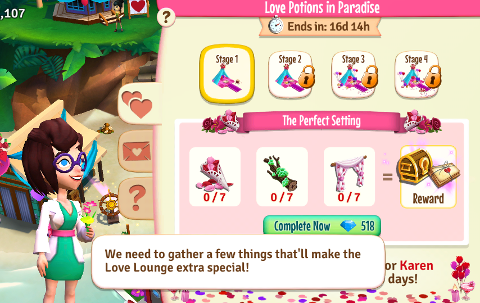 The Love Lounge opens up to the different supplies that you need to collect, as well as the different stages that you will have to complete. 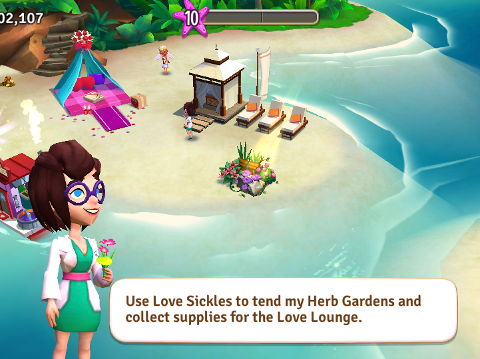 Tend Dr. Love's Herb Gardens, using Love Sickles, to collect supplies for the Love Lounge. 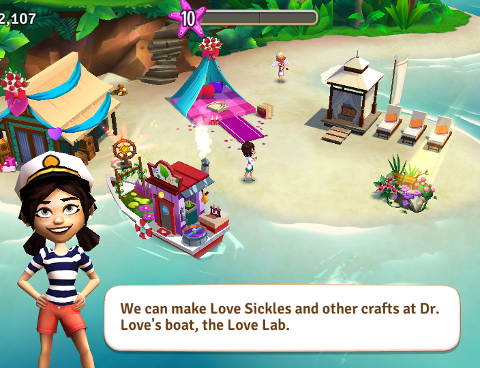 These sickles can be crafted at Dr. Love's boat, the Love Lab. Finish all stages on or before March 1, 2018 to win Dr. Karen Love as a guide for the next 30 days! 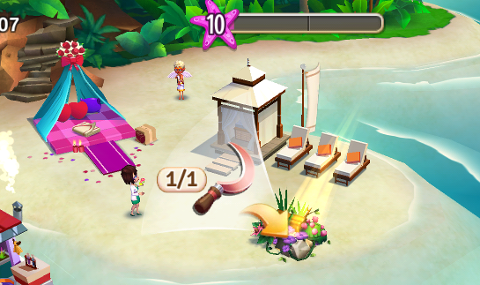 In addition to collecting supplies, you can also exchange Valentines with your friends for more exciting prizes! 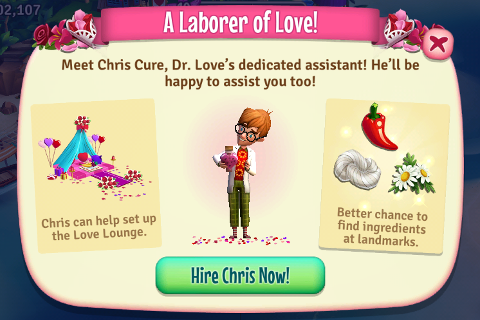 You can purchase Dr. Love's assistant, Chris Cure, to help you out during the Love Potions in Paradise event. He will give you higher chances of finding rare event ingredients from the different landmarks. 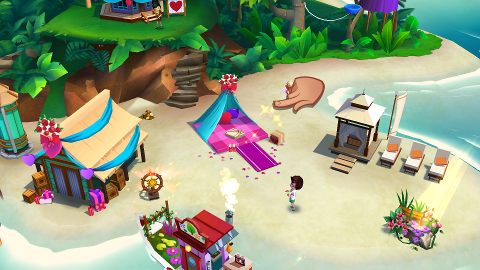 Chris Cure is temporary, and will leave your island once the event is over.